talk about a unitasker..., originally uploaded by Tashabear. I get by just fine with a butterknife, but if I made a lot of banana cream pie, or peanut butter and banana sandwiches (like, industrial amounts) I could see having one of those. 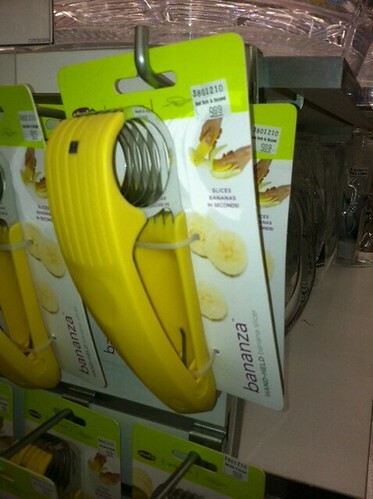 I can cut bananas with a paring knife just as quick as one of those doohickeys, I betcha. peacockduchess and my mom done taught me most goodly. No wait. no. nothing but bananas, that's meant only for yellow peelable fruit. Yes. Oh, sure... hot dogs, sausages, other tubular... Oh.